It is forbidden on a holiday to do any act in preparation for the following day,1 even if the following day is Shabbat. However, the sages created a halachic device, called an eruv tavshilin, which allows one to cook food on a holiday day for use on a Shabbat that immediately follows it. If a holiday day — whether the first or second day of a holiday — falls on a Friday, an eruv tavshilin is set aside on the day preceding the holiday (Wednesday or Thursday afternoon), so that we will be permitted to prepare for Shabbat (cooking as well as any other necessary preparations) on the holiday. Only one eruv is required per household. This year (2011), Shemini Atzeret and Simchat Torah fall on Thursday and Friday, so an eruv tavshilin is made on Wednesday afternoon before the holiday candles are kindled. This eruv consists of a challah or two matzahs, and a cooked food, such as meat, fish, or an unpeeled hard-boiled egg. I hereby grant a share in this eruv to anyone who wishes to participate in it and to depend on it. Blessed are you, L-rd our G‑d, king of the universe, who has sanctified us with his commandments, and commanded us concerning the mitzvah of eruv. 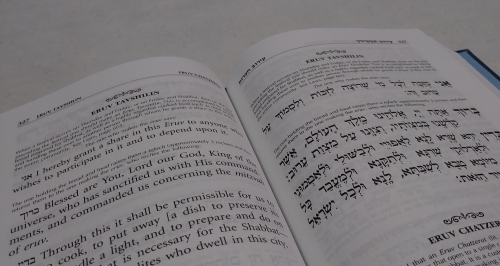 Through this [eruv] it shall be permissible for us to bake, cook, put away a dish [to preserve its heat], kindle a light, prepare, and do on the holiday all that is necessary for Shabbat — for us and for all the Israelites who dwell in this city. The eruv tavshilin only allows food preparations if the food will be ready with ample time remaining before Shabbat; enough time to theoretically allow the food to be consumed before sunset (if a troop of guests happens to trudge in to your home). This is an importnat detail to bear in mind when preparing the cholent, which cooks on the stove until the following day. The eruv tavshilin only allows one to cook on Friday for Shabbat, it does not permit cooking from one day of the holiday to the next (i.e. Thursday for Friday). On holidays it is only permissible to cook from a pre-existent flame, one that is burning since the onset of the holiday. Click here for more on eruv tavshilin. Bear in mind that the Jewish calendar date begins at nightfall. Others still will use the challah as the second (unused) loaf for both the night and morning Shabbat meals, and then consume it for seudah shelishit (the Shabbat afternoon meal) — thus performing multiple mitzvot with the same loaf.